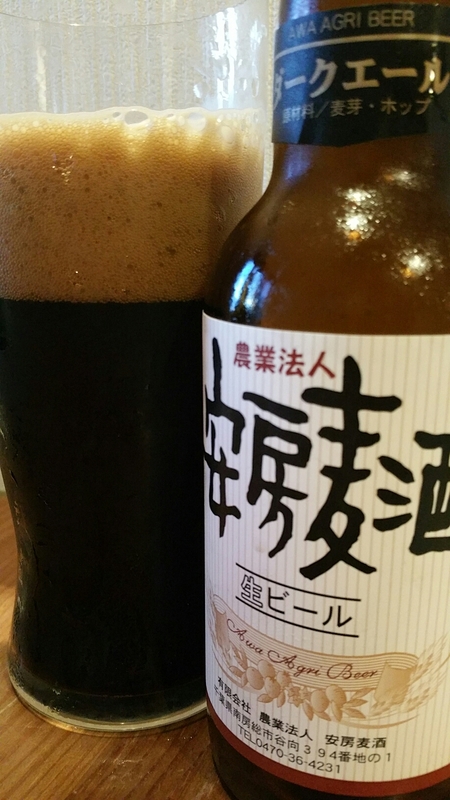 Awa Agri Dark Ale is a 5% stout-esque beer from Awa Agri Beer in Chiba. I say stout-esque as there isn’t a definitive description on what it is – it could be a schwarzbier or it could be a stout. Besides that, there isn’t much information out there about Awa Agri Dark Ale except that Awa Agri Beer used roasted malt in the mashing process. Um, it’s black. Could be a porter? Despite not really knowing what kind of beer Awa Agri Dark Ale was, this review was also going to be difficult to write. So much so, that it has already taken me two months to get to this point of writing it down. It’s hard to review a beer in the first place as different people pick up different flavours, but to write a review without really knowing what style of beer I’m drinking just makes it a whole lot more harder. Awa Agri Dark Ale poured out a deep brown, verging on black colour, with a large frothy tan head on top that clung to the side of the glass as the beer went down. The aromas coming off of Awa Agri Dark Ale were roasted coffee, chocolate, and some cream like smell thrown in there too. When it came to the tasting, Awa Agri Dark Ale threw a spanner in the works. The level of carbonation was far higher than expected for a stout and verged on schwarzbier levels of carbonation along with a watery body too. The roasted coffee and chocolate were both present in the body though the creaminess had disappeared. Awa Agri Dark Ale finished off with a slight bitterness to it; however, it didn’t last long enough to make a strong impression. Awa Agri Dark Ale is an interesting beer that could do with a bit more refining to improve the body’s texture.